Indenture agreement dated 1854 issued by the Hartford Orphan Asylum. The Asylum opened in 1831 to care for orphaned boys. The Hartford Orphan Asylum merged with the Female Beneficent Society of Hartford in 1865. They are now called the Village for Families & Children. 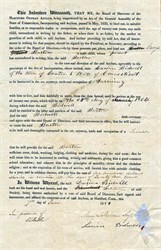 THIS INDENTURE WITNESSETH, THAT WE, the Board of Directors of the HARTFORD ORPHAN Asylum, being empowered by an Act of the General Assembly of the State of Connecticut, Incorporating said Asylum, passed in May, 1833, to bind out, in suitable families, or to respectable trades or occupations, until the age of twenty-one years, any male child, surrendered in writing by the father, or when there is no father, by the mother or guardian of such child, to said Asylum. And the said Bidwell doth covenant and agree with the said Board of Directors, and their successors in office, that he will instruct or cause the said Bartow to be well and thoroughly instructed in the art, mystery, trade and occupation of a	Farmer, that he will provide for the said Bartow sufficient meat, drink, washing, lodging, clothing and medicine, during the said term ; that he will cause him to be instructed in reading, writing and arithmetic, giving him a good common school education ; and educate him in the principles of morality, virtue and the christian religion ; and at the expiration of his term of service, will furnish him with suitable clothing, for a year, and in addition thereto, will pay him the sum of $100 should he remain till the age of Twenty One years. In Witness Whereof, Lucian Bidwell hath set his hand and seal hereto and the Secretary of said Society, being thereto authorised by a vote of said Board of Directors, hath signed said instrument, and affixed the corporate seal of said Asylum, at Hartford, Conn., this 7th day of June 1854.